Impact Hub Geneva offers a unique and creative atmosphere for events, exhibitions, and workshops. Since opening, we have hosted hundreds of events – from hackathons to creative workshops, launches, receptions, innovation days and a variety of other event formats. Our excellent pool of expert moderators, trainers and facilitators are ready to advise you on the format of your event and facilitate it for diverse audiences, and the rooms are equipped to accommodate your needs. Our space is available from Monday to Friday, with weekend bookings possible upon request. We offer small meeting rooms as well as larger event spaces. Bookings may be done on an hourly or daily basis. The spaces are versatile and can be arranged in different settings upon request. 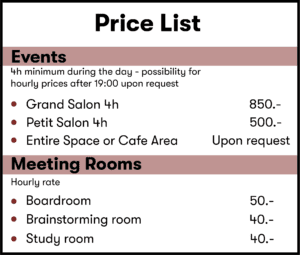 Members of the Impact Hub Geneva benefits include up to 60% discount on space bookings! We also welcome proposals from potential partners who wish to run an event with us in exchange for a 50% discount on our usual charges. Strengthen the outreach of your event with an impactful film that will be sure to excite your community! We work with an array of filmmakers and photographers who we are happy to recommend upon request.